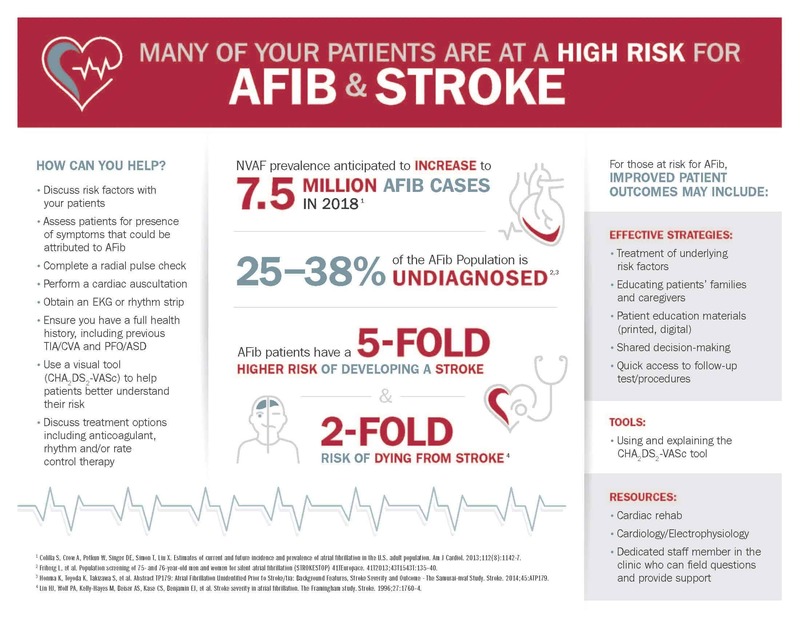 PCNA has developed this infographic based on the results of a survey designed to understand how nurses identify patients who may be at risk for Non-Valvular Atrial Fibrillation (NVAF). The infographic has two sides, which both serve a different purpose. The healthcare provider side of the infographic provides important facts about NVAF, its risk factors, signs and symptoms. Share as part of the clinical visit on an iPad, tablet or desktop, helping to guide your conversation with patients for whom visual imagery is most impactful. Print the infographic into a poster for use in the exam room or other clinic setting. Include in electronic communication with patients potentially at risk for NVAF, such as in emails or patient portal notifications, allowing patients to consider potential risk factors prior to speaking with you.